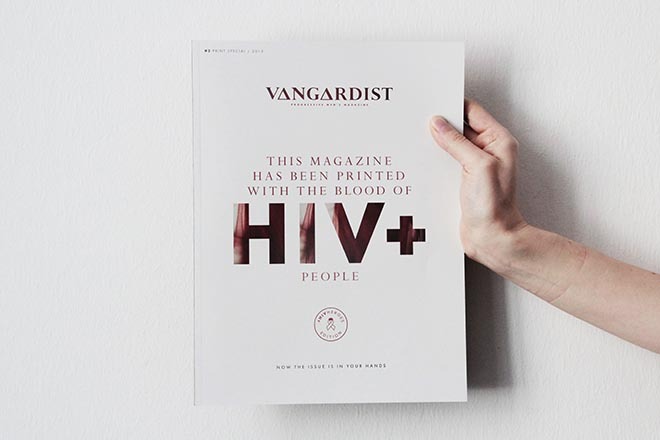 The magazine has been produced according to the most stringent controls using processes developed according to guidelines established by Harvard and Innsbruck University. 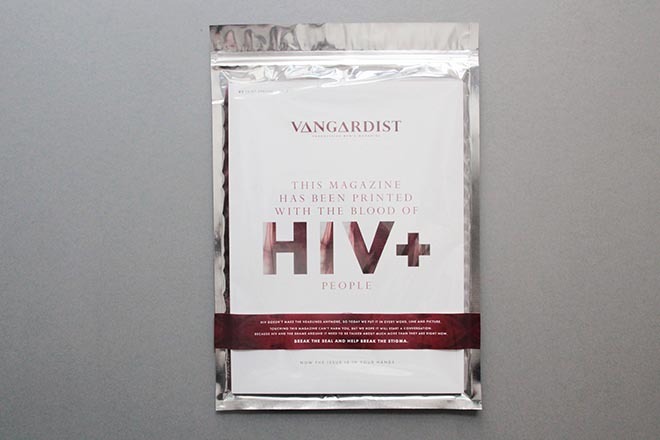 Handling of a physical copy of the magazines carries no risk of infection. Despite this, the debate and discussion around the magazine and the issue it highlights has already been significant. Jason Romeyko, Executive Creative Director of Saatchi & Saatchi Switzerland explains the thinking behind the project. 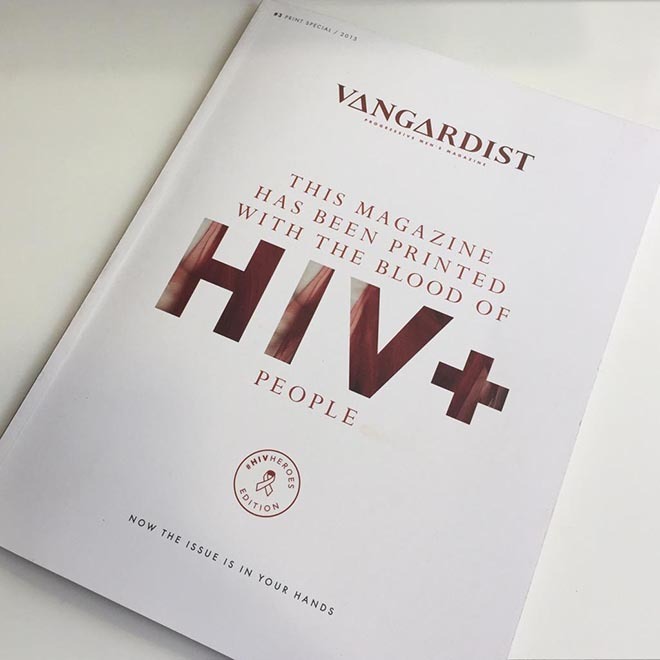 With NGO’s and Governments alike all acknowledging that the social stigma surrounding the disease remains one of the key factors preventing effective management, and ultimately the eradication of the virus, Vangardist believes it is essential that conversations around this topic are reignited. 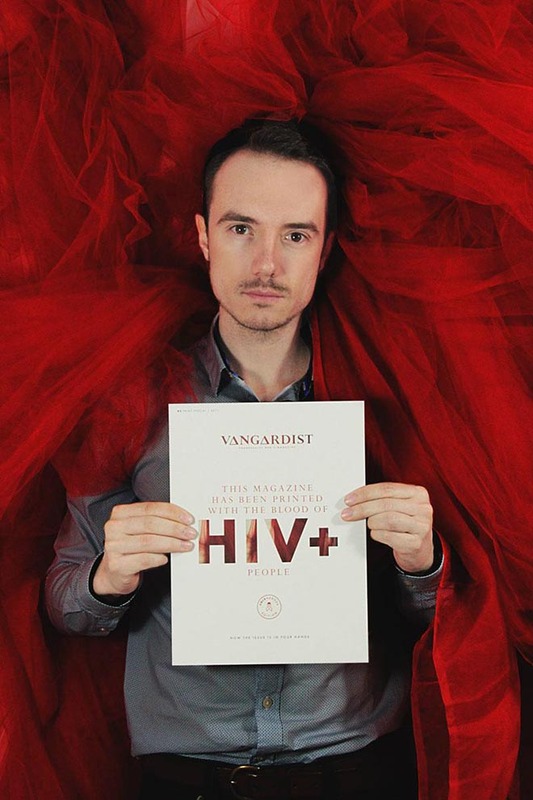 Wiehl explains: “With 80% more confirmed cases of HIV being recorded in 2013 than 10 years previously, and an estimated 50% of HIV cases being detected late due to lack of testing caused by social stigma associated with the virus. This felt like a very relevant issue for us to focus on not just editorially but also from a broader communications stand point,” he says. The magazine has been available to subscribers from the 28th April, and will be on newsstands and online from this week. 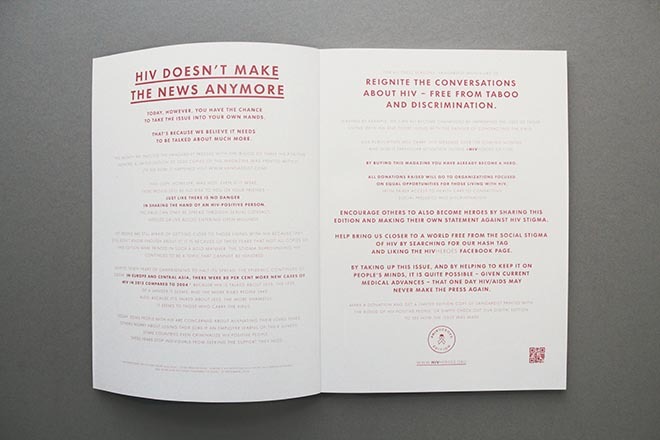 The Facebook page, www.facebook.com/hivheroes aims to be one of the most widely visited and ‘liked’ HIV related pages on Facebook, demonstrating to the world a community of people for whom the HIV virus carries no social stigma exists. This campaign aims to show that a community of people around the world willing to publicly show their support and become #HIVHEROES online, even just by talking about HIV, people can become HIV Heroes. In addition to lending their support socially to the campaign, individuals interested in getting even more involved, will be able to participate in an online auction later in the campaign when further copies of the magazine will be sold in an effort to raise additional monies for HIV related causes / organisations. The Vangardist Cover project was developed at Saatchi & Saatchi Switzerland by executive creative directors/copywriters Jason Romeyko, Jan Teulingx, John Pallant, designer Magda Weyrer, art directors Lenient Vedts and Gustavo Figueiredo, planners Melissa Masurel and Luca Conte, producer Andy Gulliman, content copywriter Rob Wetton, photographer Jean-Pierre Van der Elst, CEO Andrea Pedrazzini, CEO of Dynamic Markets Justin Billingsley, Technical Director at Saatchi & Saatchi London Mike Mackay, worldwide creative director digital Tom Eslinger, Saatchi & Saatchi UK art director Shane Horn, UK head of editorial Lucy Titterington, PR team Isobel Kerr-Newell and Zoe Kent, account director Emma Jenkin, account managers Guendalina Gennari-Curlo and Nicolas Pignatelli, working with Vanguardist team Julian Wiehl, Lukas Burian and Carlos Gomez, . Filming was produced at Pulse Films.